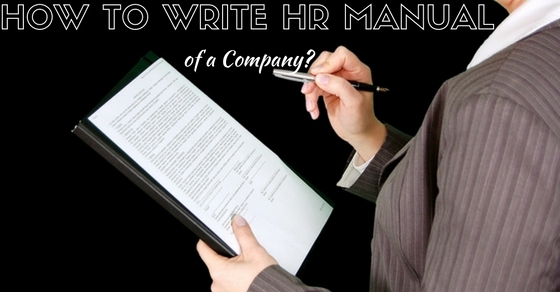 How to Write a Human Resource (HR) Manual of a Company? The human resource manual is a document which explains about all the policies and the relation of the employees with the managers. What kind of relation the managers are supposed to maintain is all explained in the HR manual of the company. It takes the form of the employee policy handbook or we can say any other internal document of the company which aims at describing the practices at the workplace. The audience must be thoroughly known to you. If you know your audience, you will be able to write exact and straight to the point without beating about the bush. You might also have to face problems while writing. The writing of the manual should only be focused on what you have to write. So, first know for whom you have to write and then start with the step of writing. Whatever are your policies and procedures, just know them properly. Learn and read about the company’s rules first. Go through them and then step ahead with the writing of the manual. All the policies of the company are not meant to be penned down, so first go through all the policies and then decide which one is to be written in the manual and which one is to be ignored. Having written all the important policies, make sure you also write about other important things like dress code, sick day’s procedure and the vacations. Also, do not forget to write about the promotions. All these need to be known very well as the wrong policies could convey a very wrong message to the employees, especially for new employees who are supposed to be the members of the company. Write down the organizational policy for every category of the organization. State the position of the organization regarding the mentioned topic and the proper procedures for the purpose of management. Each employee should know the policies of each category so that no mistake is done by any of the employees, whether it is in the terms of the dress code or the submission of the assignment provided on a daily basis. Write down every procedure with all the complaints and the grievances expressing in detail, the method employees need to use to specify and obey certain rules or the policy. Find the detailing of every single rule so that the consequences are also known to the employees, in case the employees violate the rules or do not obey them. One should also mention the circumstances like death and emergencies in the HR manual so that the employees and the outsiders know about what they need to do during those circumstances. What rules they need to follow and what not. What restrictions they are bound to and what freedom they are entitled to during the cases of emergency. So, this section of including the emergencies and other natural calamities should also be mentioned in the company’s HR manual. Once you have decided what to write, which audience to cater, the next step would be to write the introduction to the HR manual. In the introduction you are supposed to write the company’s approach to the human resources in general and also about why the certain policies adhere to this type of philosophy. So, make sure you do not forget to write down the introduction as the intro is supposed to let readers know what all is written in the manual and what policies it could have described within the manual. You just need to write down the relevant stuff. Do not just beat about the bush as you will not be able to make others understand the actual policies and the procedures. In order to make the policies understandable, you need to write in a specific manner. So, make sure you write all the relevant points only. The manual should represent the positivism. The policies of the company should not reflect anything negative about the company. So, to prevent any sort of negativity, it is important to list down the policies and the rules very clearly and without leaving any doubt in the minds of the readers. When you write down in a clear manner, you get a chance of luring more skilled employees as the skilled and the experienced one’s would only visit the company through the manual your company carries. So, make sure when the HR policies and procedures manual is being prepared, the mistakes are not made and it showcases the professionalism. Whatever you write should be specific and crisp. Do not beat about the bush while mentioning the hr policies and procedures. Just be clear, even if you have to be little harsh while writing the policies, because it is better to inform in a harsh manner than to regret afterwards. Specific and a brief employee manual help in attracting more people towards its reading. The lengthy you will write, the more you will make your manual boring and less interesting to read for the reader. You are not required to fill up the company policy manual. You are just required to inform about the company’s policies and the kind of relation employees need to maintain with the managers. Instead of repeating the points, just make sure you put in every possible point so that no point is left out. Just review once before finally submitting the manua. All the important points should be given in it or you might have to face issues as the mistakes by the employees can lead to problem for the company itself. The HR manual represents the company on a whole so just make sure you give a positive review of the company for which you are making a HR manual. The grammatical mistakes makes a wrong impression so before you finalize on everything with the HR manual, just make sure you once get it checked and no grammatical or silly mistakes are done on it. If the manual will be full of mistakes then it will surely put a bad impression not only within the insiders but also the outside market. While you write a HR manual, just make sure you follow a well planned format for it. The proper format will help you in being in order and also it makes the manual eye candy. So, if the company wants to attract more employees, then it should prepare the manual in a professional manner with proper format. Following the proper format not only presents company’s image but also gives a clear cut message how stern it is regarding it’s policies and the rules. Also, it gives a positive impression among the external members of the company. Make use of vibrant colours while writing for the HR manual. The more colourful it will be , the more it will be attractive. Boring manual is not at all eye catchy and if the person is a non reader then he or she might want to get rid of the manual rather than reading it with great interest. So, try and make use of different colours and fonts while making the HR manual. Add pictures into the HR manual of the company. This will give more interest to the reader for reading the manual even if he or she will be less interested in reading it. So, make sure you put some pictures in the manual. The pictures can be of the employees working in the company or of the company’s logo and so on. The pictures can also be abstract and attractive. The more attractive the picture will be, the more readers will be attracted towards the manual. They would also find it interesting to read. So, if you want to attract maximum employees , just make the HR policies manual more interesting and worthy to read. In the apology letter you do not have to prove how good you are at one language like English etc. So, adhere to write simple English and do not make use of complicated words. The words will however reflect the knowledge you possess, but your aim is not to showcase the vocabulary bank to the boss. So write very simple or a layman English. The usage of difficult words will leave the reader on a difficult footing that you would certainly not want. Before you submit the manual to your boss, go through it yourself so that there are no silly mistakes left. If you feel like not being sure of whether what you wrote is right or wrong, just show it to any one of your close friends and correct the mistakes in it. When you write long sentences, you are not able to read and understand it properly. So, make sure your sentences are short and crisp. They end up reading in one breath. These type of short sentences help in understanding the rules in a better manner. Also the long sentences confuses the reader as in what the writer actually wishes to convey through his writing in the manual. So, it is better not to put any sort of query in the mind of reader. Just be clear and simple in your language. The English that you write down should not be complicated. Also make sure you just do not write it in English but in one or the other language too. If you write in other language, you can hope that the manual to be read by the other people who do not actually understand English very well. So, whichever language you choose to write in, make sure you are good in it and do not just make number of mistakes while you write. Whatever you write, just give pointers. This is because the information written in pointers is always attractive and easily readable by all. Do not make big paragraphs when you write. This is because, not everyone has time and patience to read the lengthy paragraphs. So, make the HR manual as short, attractive, crisp and in pointers. Highlight the important points with different colours and also write the important information in capital letters. The important point should be properly highlighted so that even if all the matter is not read, the important points get into the mind of the reader. The manual is meant to inform about the policies and the type of relation the employees and the managers need to have with each other. So, if you will write anything wrong or if you lie, you would probably fall in a problem. Not necessarily you, but your company as it only decreases the credibility of the company in the eyes of the outsiders. So, never lie when you write about the employee policies and procedures and the rules of the companies. This is because when you write lie about the rules, the company itself has to face the consequences of the wrong thing communicated throught the HR manual. So, these are some of the points that one should keep in mind while writing the HR manual.